Flood waters devastated Nebraska this month. Seventy-five cities, 65 counties and four tribal areas issued emergency declarations. Flood records were shattered in 17 places. Three Nebraskans died. And even if your property wasn’t submerged, the floods impacted thousands more whose basements were flooded. Damage to submerged heating, ventilation, water heaters and air conditioning units is dangerous. They can malfunction and corrode. If you’ve ever had the misfortune of a flooded basement, you know how quickly it wreaks havoc to your life. More than $3 billion worth of flood insurance claims are filed each year in the U.S. This year’s total is expected to climb well above that. Regular preventive maintenance can protect you from having to file a flood claim in the future. Our HVAC professionals install flood protectors like safety switches and flood detectors to safeguard your home. Is your home in a flood-prone area, near a river or lake, or even smaller bodies of water like creeks or irrigation canals? Are any HVAC components in your home located beneath water sources like sinks, toilets or bathtubs? Do you have sufficient outdoor drainage? Living on a floodplain like much of Nebraska increases the likelihood your basement will flood. It’s important to know what to do if that happens. 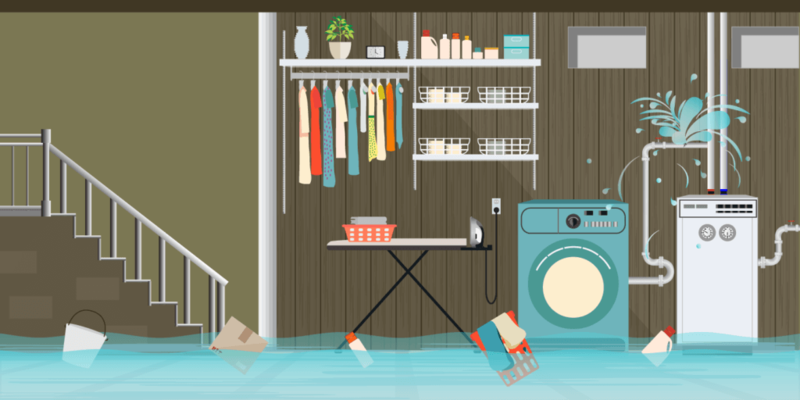 What happens when your HVAC is flooded? Backed up sewer and septic lines. HVAC systems aren’t designed to be submerged. Not only can it cause fire and electric shock, each submerged surface can become home to microorganisms that cause health problems. Floodwater leaves infectious bacteria inside the duct work and other parts of your HVAC system. This can cause bacteria like E. coli, salmonella, shigella, hepatitis A, typhoid and tetanus to grow. Any bacteria present becomes airborne in your home if you turn your HVAC back on without thorough inspection and maintenance or replacement. Check all gas appliances for water damage. Damage to appliances like heaters and broilers can be hard to spot if the exterior is dry. Call the experts to check for and fix corrosion to valves and controls, and prevent future costly repairs. And remember to check your electric furnace. Water corrosion can damage its coils, controls and thermostat. If your basement floods, leave inspections, maintenance and repairs to a local, licensed HVAC contractor. Contact Eyman Heating, Plumbing & Air immediately to assess the damage. Our experienced contractors will identify and resolve any issues quickly to prevent further damage to your HVAC system. If necessary, they’ll replace units, equipment and parts in a timely manner. Your HVAC contractor should clean your system thoroughly. Prior to doing so, they will isolate the area under negative pressures. Workers should wear OSHA code regulators and follow all additional OSHA standards. Remove all flood-contaminated insulation around and within HVAC system components. Discard it appropriately under applicable federal, state and local regulations. Remove the contaminated HVAC filter media and discard it appropriately under applicable federal, state and local regulations. Clean all flood-contaminated HVAC system component surfaces with a HEPA-filtered vacuum cleaner to remove dirt, debris and microorganisms. Disinfect component surfaces while the HVAC system is not operating. Depending on the amount of debris, you may have to mechanically clean the components with a steam or a high-pressure washer before you disinfect them. Follow the disinfection with a clean water rinse. Replace the insulation – preferably with an external (e.g., not in the air stream) smooth-surfaced insulation to prevent debris and microorganisms from collecting. Make sure the HVAC fan is removed and cleaned, disinfected, dried thoroughly and tested by a qualified professional before it’s put back. Consider an upgrade of the HVAC system filtration to the highest efficiency filters practical. Your HVAC contractor will diagnose the level of damage to determine whether components or the entire unit must be replaced. If your unit is cleared, replace all filters immediately. Run the unit for 72 hours without anyone present to assure safety. If your system must be replaced, consider an upgrade to an energy-efficient model. Newer models can reduce energy costs and may even come with rebates. Ask your HVAC contractor for recommendations. For more information or to schedule an appointment, call Eyman today at (402) 731-2727.